Straps have always been a great add on for musicians not only for the comfort part but also to showcase their instruments. 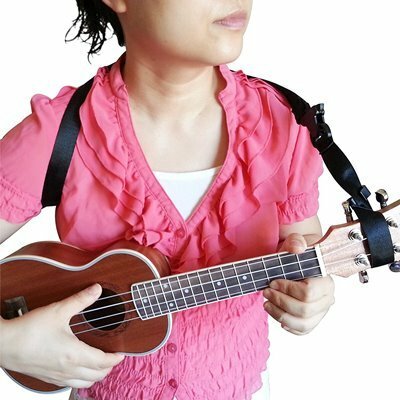 If you are an Ukulele user, knowing about ukulele straps is a great idea. 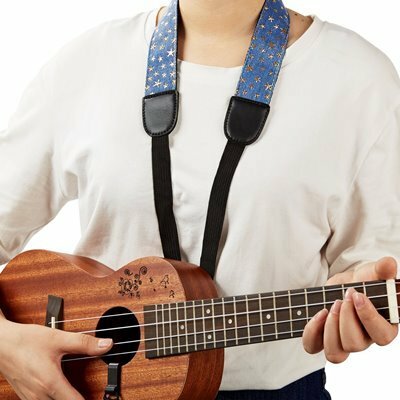 This article is all about the best straps for Ukulele so that you can go ahead and buy the desired version for your needs. We have done our research going through thousands (almost all Amazon reviews) of units out there. That’s what makes us very confident about these 10 units. 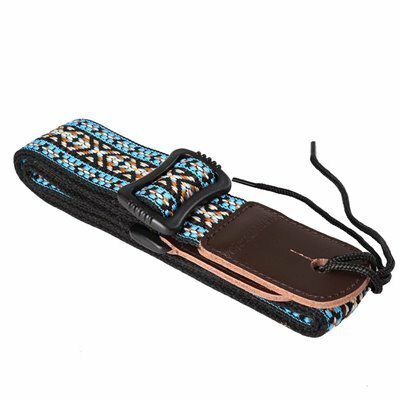 The first one that we have here is the Clip on Ukulele Strap which comes in two different colors that are black and blue. The idea is simple. You go ahead and strap this unit with the hole of your ukulele without any drilling or other methods being applied. This is simple and easy to get started. Also, you get two free picks when you are ordering one strap. The straps are resizable and fits all ukulele models. This interesting looking strap is developed by the brand music first. There are again two different colors for you to choose from and both the designs have color variations in them. The outer side is made of cotton where the inner part is made of leather to give this enough durability. The strap is very strong and the thickness along with width and length tells you the same thing. 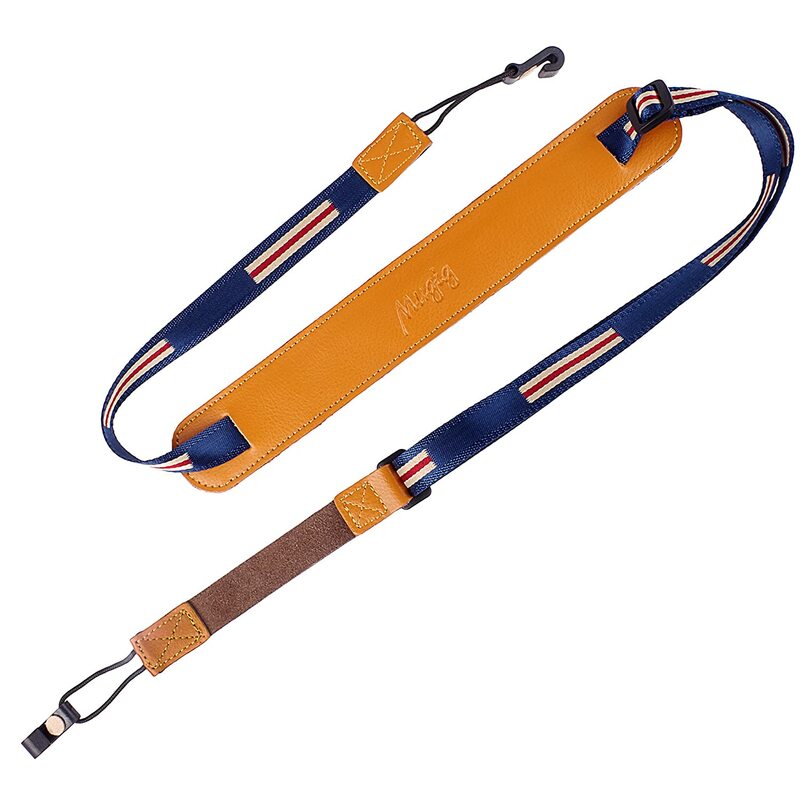 If you want to use one ukulele strap for a long period of time then this is the one for you. The unit is ultra durable and extremely comfortable at the same time which is a rear match. 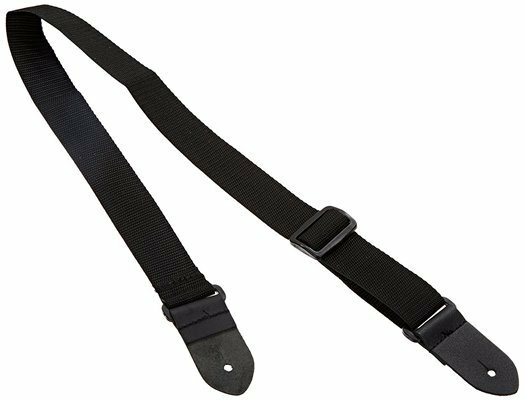 The length of this strap is adjustable from 29.5 inch to 53 inch which should be big enough for almost everyone. There is an extra nail button and a string in case if you need an extra one. All in all, definitely a great pick to go for. Here’s another music first product that you can go for. The price is extremely cheap if compared to the value that it offers. The unit is made of nylon and ABS plastic. The width is standard and the length varies from 22 inch to 39 inch. Yes, there are better options out there than this one but you will not probably find a better combination of price and value. This is another very cheap option to go for so if you are looking for something cheap then this is the unit. With 1.5 inch of width and two different colors with not much design, this is a unit that is very common among ukulele players. The button free design and the strong buckles are loved by users. The company pretty much guarantees you 100% satisfaction. The hooks are made of ABS plastic. 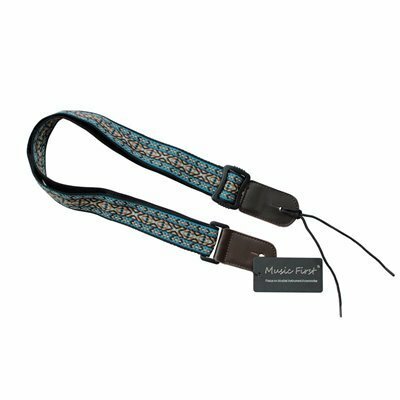 With a pure Hawaiian design and cotton body, this is an interesting strap that you can choose. There are different color options for you to go for with pretty much similar designs on each of them. Obviously, the unit is adjustable and fits all height and ukulele types. You will get a few free strap buttons along with the unit which is fun to have. The strap is comfortable and easy to use which is more important than anything. This is a simple yet elegant ukulele strap that you will find and that’s why this is a good one to pick. This is a new design from the brand Mugig and as we have already reviewed a few of the Mugig units before, you already know that they are a good brand. The design looks like a leather product and it is one too. The ABS hooks are good enough with soft edges. The unit length varies from 38 inch to 49 inch and it fits all ukulele with the side straps. The next in our list is something from the brand MoozikPro. The brand name is interesting and so is the product. If you are looking for a simple strap and if that is the condition for it to be the best strap for you then this Moozikpro Ukulele is definitely the one. 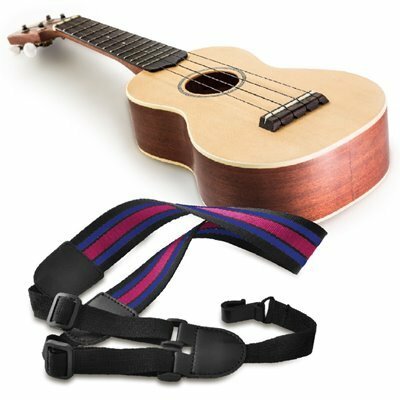 Where many people will not consider it to be one of the best straps for ukulele, we think otherwise. It all depends on your taste of color at the end of the day though. The unit ranges from 36 inch to 65 inch which is better than most we have reviewed. 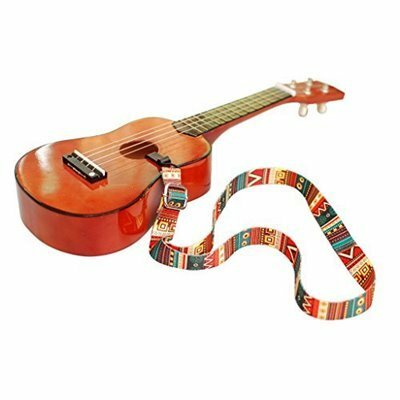 What is the one thing that is a must in the best straps for ukulele? Nobody knows the answer but we can predict that it will be either durability, good design or the combination of these two along with the price. The good news is that this one has all of it. On top of that, this is certainly one of the most comfortable units that you will wear. The strap is made in Canada. It is a pure black model with no design what so ever which might be a negative factor to some people. With 5 different color options to choose from along with unique design and very good pricing, this is definitely one of the best straps for ukulele at current market. It fits any ukulele size and shapes no matter whether it is a concert unit or a pineapple model. The length varies from 56 to 74 cm and this is a button free model which is good too. The color and design variations are worth giving your attention to. Obviously, you have to understand that different straps have different benefits and you are the one to decide at the end of the day which one to go for and which to ignore. Often, it all comes down to the look of the straps where clearly, our recommendations will not matter much as this is more of a personal thing. 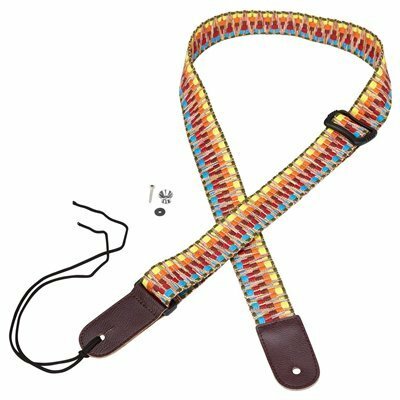 The best idea is to combine the features and the look of your strap along with the price to get the best results.